E2open Buy-Sell Management Data Sheet - E2open | Demand. Supply. Delivered. When manufacturing or construction is outsourced, materials procurement is often outsourced along with it. As a result, enterprises quickly lose visibility into essential planning and execution data. 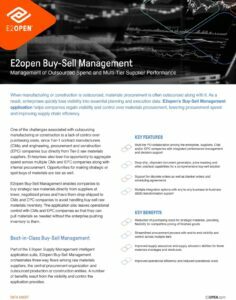 E2open’s Buy-Sell Management application helps companies regain visibility and control over materials procurement, lowering procurement spend and improving supply chain efficiency.